Product prices and availability are accurate as of 2019-04-21 15:45:45 UTC and are subject to change. Any price and availability information displayed on http://www.amazon.com/ at the time of purchase will apply to the purchase of this product. Ideal for use in non-hazardous environments where general protection from dirt and grime is needed. Can be used by hospitals, clinics, laboratories, food-processing facilities and in paint applications. 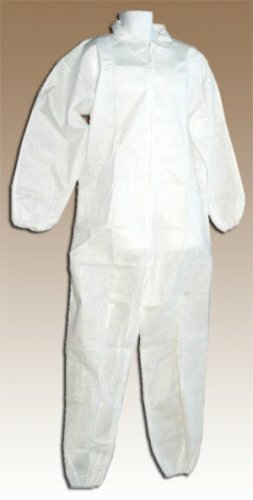 The disposable economy white polypropylene coveralls protect clothing from paint, dust and dirt. For non-hazardous use only, the coveralls are made of lightweight white, polypropylene, breathable fabric. They feature a front zipper with elastic wrists and ankles. This pack includes twenty five extra-large pairs of coveralls.